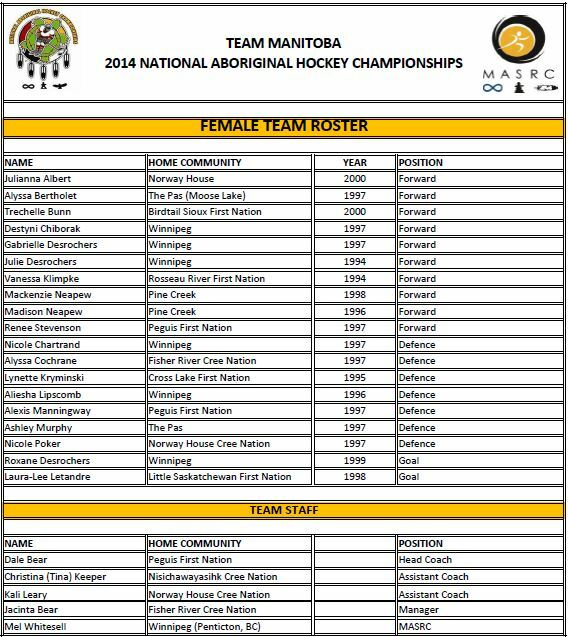 2014 National Aboriginal Hockey Championship female roster announced | Manitoba Aboriginal Sports and Recreation Council Inc. The MASRC is excited to release their Female team roster for the 2014 National Aboriginal Hockey Championships. With the 2014 NAIG Games also occurring next year, we decided to be proactive and get NAHC team selections completed early. Many of the girls on the Female 2014 NAHC team are also competing in different sports at the NAIG games. So far NAHC girls have been named to the Canoeing, Volleyball and Basketball teams. Please join us in congratulating these young skilled Aboriginal hockey players!